I don't care who leads the country provided they lead rather than dictate. My problem with the govt and the voters is they are voting for 'popularity' instead of sound visions. I want a govt that is fiscally sound and spends money wisely. Do you know how many federally funded employer service providers there are? How many deal with apprentices? Try ringing one of those federally funded apprentice service providers and say something like "My son's employer doesn't think they can keep him on next year. Can you help him to find a new employer and assist him in creating a resume to help him find a new job?" The answer will be "No". We do not do that. We just fill in the forms and lodge them to the govt departments. So we the public are funding a large amount of private companies to do sweet stuff all whilst putting great spiels on their internet pages that would lead people to think they are earning money helping people get jobs. Yet another example of govt waste of our money. Bring back the old CES that did match employers, list jobs, help the unemployed. It would not take much for the govt to find out how effective their spending is. No paperwork involved even. Just a few phone calls to things they are funding and asking for services they advertise and are being paid for. If those services don't exist then neither does the funding. People need to get over the "politics", 'Parties", "personalities" and get a government that spends the money wisely before being taxed out of existance and into debt for the country forever. I find it amusing how quickly so many on the right are attacking Turnbull. What about the 54 members that voted for him? It is not the fact that Turnbull kicked Abbott out that Liberals are railing [I'll happily admit Abbott deserved a lot of kicking for his unqualified support of failures like helicopter Bishop and Eddie Obeid's gofer Sinodinos - who then stabbed him as thanks]. No... It is because Turnbull is like Rudd on steroids. A VERY VERY flawed and dangerous man. To be honest - I would prefer Shorten in power than Turnbull. This is our new Leader. Go for it Yassi / CF - I'm depending on you to do Gods work and spread this far and wide in your quest to destroy the Torries. And don't forget to mention the cat in the freezer! So yeah - I'm cool with kicking out the 54 that supported MT, and even cool with kicking out those that didn't. Those had a duty to ensure that a narcisistic piece of work like MT [clinically diagnosed!] didn't get a chance to do what he did. Failures the lot. We don't need self serving selfish bottom feeders in parliament representing us - we need people with honour, integrity and unbending drive to work for Australia. a narcisistic piece of work like MT [clinically diagnosed!] didn't get a chance to do what he did. Care to offer some evidence as to this claim ! Tony Abbott's speech was very dignified. Really? I saw plenty of bitterness in there. Fancy telling the media how to behave after he used it to drag down the Gillard government and stood under a placard that read "ditch the witch" as a media stunt. I also saw plenty of ranting about so-called achievements that many people think are his greatest failures. Good riddance to bad rubbish. I was referring to his call for all his supporters to unify behind the new Government Leadership. He does have a lot of old school qualities about him that has never been seen in Australian Politics for a long time. And yes, I also believe the media have been a HUGE issue in Australian Politics for the last few years, from Rudd/Gillard/Rudd to Abbott/Turnbull. Australia does deserve much better and if we keep this up, I can't see much good coming from it. We are going to have Governments which are continuously looking over their shoulder and unable to Govern effectively. We need to look at this very seriously and I am not saying this from the Liberal perspective but from a Labor and Liberal perspective because the media's behaviour and all these 2 weekly polls have really compromised our Governments (Abbott, Gillard and Rudd). Maybe they were all hopeless but they all did some good things too but there was NEVER any media focus on the good things, just every childish and inane negativity they could get their grubby hands on. Oh yeah ... Before everyone with short memories ignores my above - this is why the lefties absolutely HAVE to have Turnbull in power (you know him, the messiah that everyone wants to be god emperor). I also reckon you have your pollies confused too .Abbott was the one quoting god all the time. Very observant CF... But OOOHHH do I have a gripe with Turnbull. And as to Abbott - his biggest failing was that he was too good and too nice. Instead of trying to be a nice guy for everyone - He needed to man up a bit, get some mongrel up and thrash out the stale chaff in the party room if they didn't perform, and actually deliver what he promissed. Repeal of the RET, repeal of18c; lower taxes and shred the public service. And immediately force the resignation of Sinodinos once he got shown up as Eddie Obeid's bum boy, kick Helicopter Bishop out on the street; and (his biggest error) force Turnbull to slash the ABC back to a kiddie channel, a rural channel or two, and a vehicle for innovative Aussie drama. That he didn't do this - and via a Double Dissolution last year if necessary - is for ever going to consign his tenure of the PM job as "Oh what could have been". You sound increasingly like an extreme right party room member each time you post. Thankfully as witnessed this week that type of politics no longer has a place in this country. A double disillusion would have brought down the entire party. Not just a handful on his front bench (and himself of course). They have been in an election losing position since abouy a month after they formed government and slowly knocked extra holes in the hull the further they sailed. Great to see Dutton offer to resign. The water was lapping at his feet. The ABC was the least of Abbott's problems. When the Murdoch press started running news against a couple of weeks ago it was all but over. Thankfully as witnessed this week that type of politics no longer has a place in this country. Indeed - and thankfully our choices of leaders are now either narcisistic psychopaths or accused rapists and Union fraudsters or maybe drug dealers wives. Thank god our option doesn't include somebody who once munched on an onion. Sarcasm won't work where Abbott is concerned I'm afraid. He was so much more tainted than just the odour on his breath. The votes have been tallied and the results shown....5 months after a "record setting" election victory a swing seat in the most conservative state of our country.If the sentiment wasn't there then in theory the libs should have romped it in shouldn't they? Oh, and ther is only one 's' is Yasi thank you very much! Because it is the oppositions job to not make it easy for the government CF. The hint is in the name, they are supposed to oppose any and everything they can, not act as a rubber stamp. Here for those attacking labor for not passing the Coalition's budget measures. .....and the attempt to silence the ABC gathers momentum at News Corp. The major thorn in Abbott's plan to run a dictatorship . No surprise they are slipping in the polls Crookhaven. They are an embarrassment. ...watch your backs at the ABC. You are the biggest threat to Abbott's re-election chances and he knows it. From December 2013. Abbott was as predictable as they come. Of course it had nothing to do with his bad leadership. Cabinet is named. Some surprises in there. Bills response. Typically pathetic spending all his time saying what the new team 'might' not do or 'may' not change. Simply trying to surreptitiously suggest it 'hasn't' and 'won't' happen but too gutless to say it right out as he knows he may be proven wrong. What a piece of crap that man is. Cut right from the Abbott cloth. What a fantastic year ! 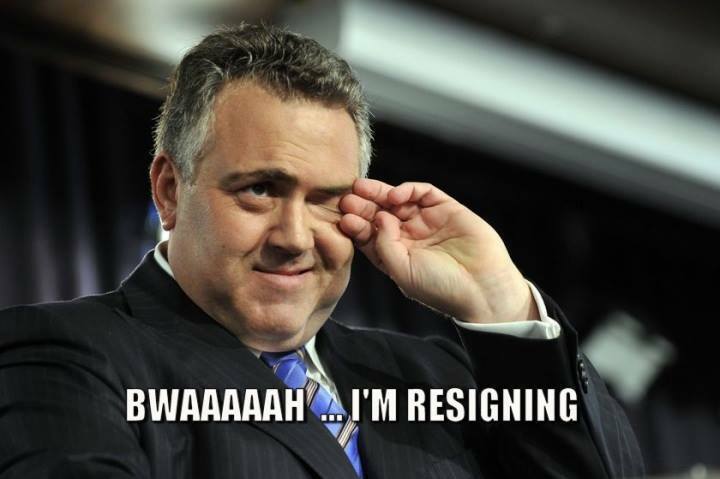 Newman, Bronnie Bishop, Abbott and now Hockey all binned. Shorten to go and then maybe just maybe parliament can't start acting like adults again. Given the govt is spouting how good this latest trade agreement is, removal of tariffs how do they explain adding a tariff (GST) on all goods bought overseas? That was Hockey's moronic idea. I'll take bets they slowly creep the freshhold up from $0.00 after it comes in like other countries had to. It wouldn't be hard to bring it to its knees simply by starting a social media page and spreading the word for all online shoppers to buy a bulky and largely useless item for a couple of bucks from China and refuse to pay the GST. They'd have warehouse full of items in no time. Generated in 0.058 seconds in which 0.044 seconds were spent on a total of 14 queries. Zlib compression disabled.